Get to know this hardy, underrated leafy green vegetable. 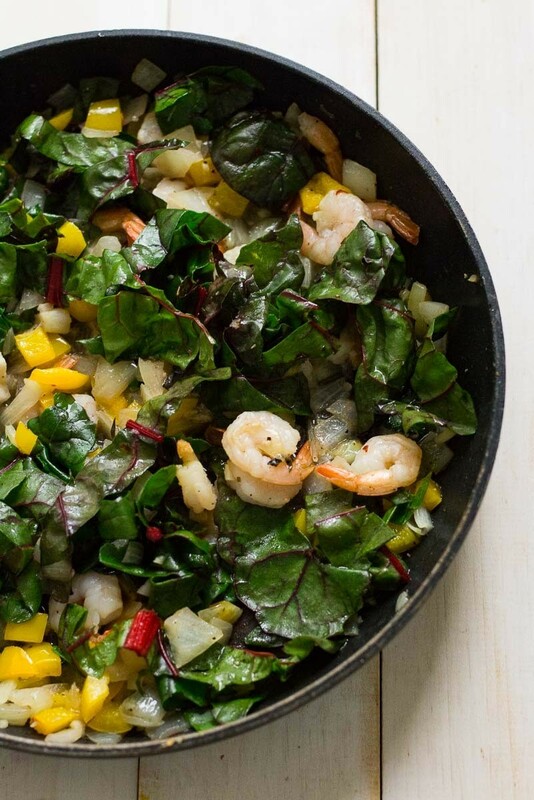 Swiss chard is a hardy, underrated leafy green vegetable. Much like the more popular greens under the foodie spotlight, such as spinach and kale, chard is super nutritious. It's packed full of antioxidants, bone-building vitamin K and magnesium. Chard is a member of the same family as beets and spinach, with the same earthy taste that is also slightly salty and bitter. There are two seasons for chard: from June to August, and from October to April. Unlike its name might suggest, Swiss chard does not originate from Switzerland, but rather the Mediterranean. Its dark green leaves are hardy in texture and fan out from tough stalks that range in colour from white to yellow to bright fuchsia and red. Though Swiss chard is also in season during the summer months, it is popular to serve in stir fries and comforting soups during the winter. Make sure the Swiss chard you're choosing is crisp with no evidence of wilted or torn leaves. Choose a head like you would when picking any other type of green, but beware of the colour of the stalks if you plan on using them: the white stalks are less bitter than any of the colourful ones. Swiss chard can last up to a week in the fridge if cared for properly. Chard can be rinsed and kept in an airtight container with a wet paper towel over top to extend its shelf life. It can also be frozen once it's been boiled and blanched to be used in stir fries. 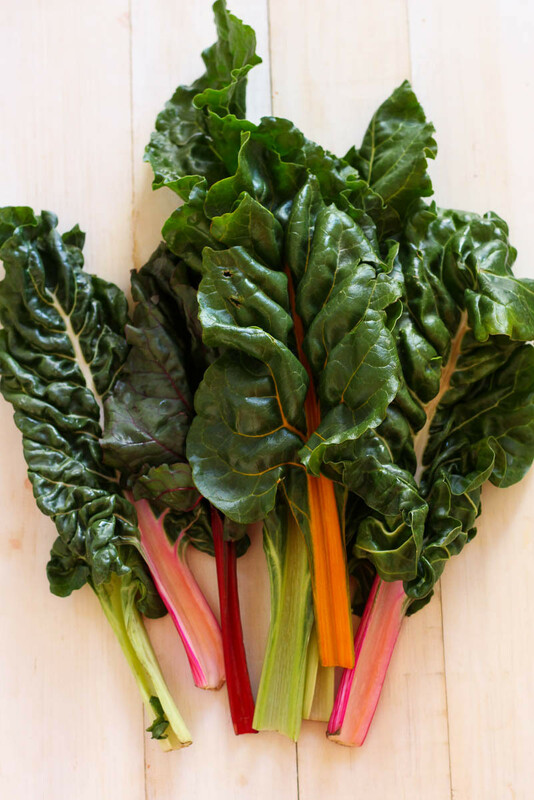 When you're ready to use your chard, make sure you rinse the leaves thoroughly if you haven't already, and then chop into bite-sized pieces or tear the leaves like you would normal greens. They can be served blanched, sautéed, roasted or raw. Heat olive oil on high heat in medium pan. Add onions and garlic, and sauté for about 30 seconds or until fragrant. Add shrimp and yellow peppers, sautéing for another 2 minutes until shrimp starts to turn pink. Add salt, pepper, chili flakes and lemon juice and stir well. Meanwhile, cook quinoa according to package directions. 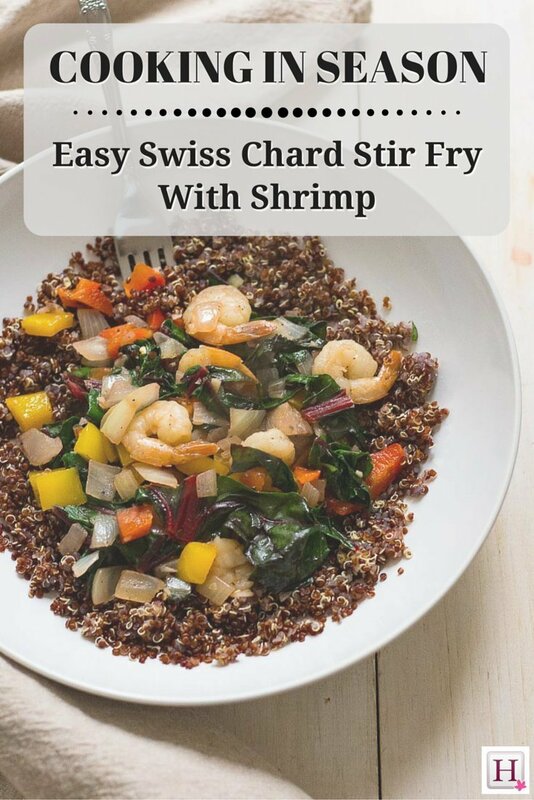 Add Swiss chard and red peppers to the shrimp mixture, and cook for about 1 to 2 minutes, or until chard is tender and slightly wilted. 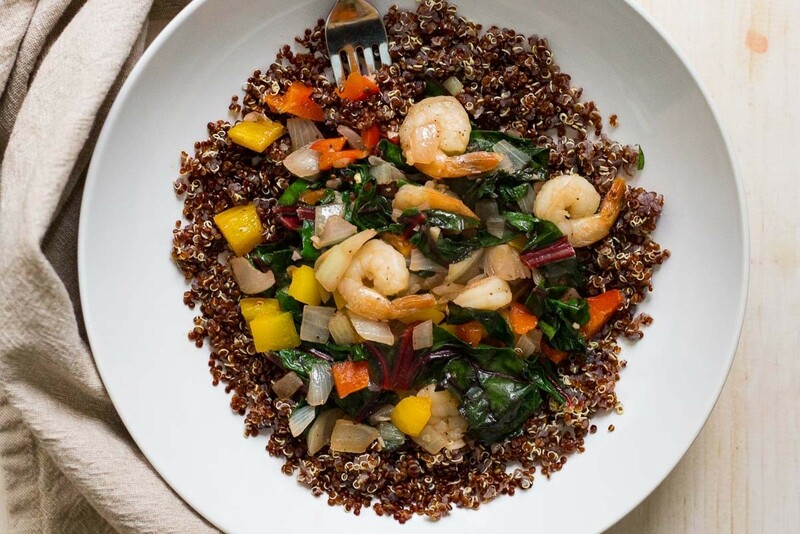 Serve chard and shrimp mixture on top of red quinoa and serve immediately.